Michael Satrazemis is the Director of Photography of the tv series Walking Dead. He has also directed 7 episodes of the successful tv series. Michael is of Greek descent. He started his career in the entertainment business as a grip on “My Cousin Vinny”, and he transitioned into the camera department soon after. He has been working in the camera department for two decades. Cinematographer Michael Satrazemis began as a camera operator in season one, before rising to serve as the show’s primary Director of Photography and occasional director in season four. 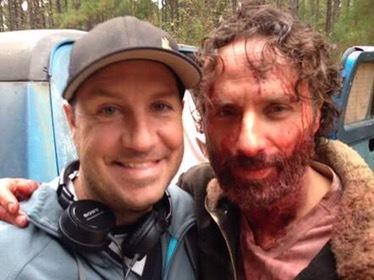 He worked as the “A” Camera Operator on “The Walking Dead”. Camera Operators perform a vital role within the camera department, by supporting the Director of Photography and the Director by accurately carrying out their instructions to achieve their vision. “There’s going to be a good deal this season, more than we’ve ever seen. It’s great to shoot those. We can put on the widest lens we have and fill it with information — people and walkers. And it’s crazy to see that many walkers. I’ve always been attracted to the show because of the story. So any time we isolate a couple of characters and get to tell the story that’s underneath this comic book, apocalyptic show, that’s fun for me” he said in an interview about season 4 of the “Walking Dead”. Because of the show’s constantly evolving storylines, Satrazemis notes it’s difficult to plan too far ahead. “’Walking Dead’ in general there’s always some trick to something because we don’t have sets that remain for very long.